Kom in de eerste week en profiteer van kortingen tot 25 procent!! Het hostel heeft een breed scala aan diensten en faciliteiten in een volledig opgeknapt pand. De locatie is perfect, in hartje Lissabon vlakbij Praa do Comrcio. Beter kan niet! Doordat de gemeenschappelijke ruimte met bar goed gescheiden is van de slaapruimtes, voldoet het hostel aan de wensen van zowel jongeren als families. - Maak gebruik van de professionele keuken! - Een bar/club op de begane grond! Boek nu, zodat je n van de eerste gasten bent die van de kwaliteit van het hostel geniet. I've been in many hostels all over the world but Yes Hostel was one of the best! The crew makes you feel right at home and the daily dinners, tours and pub crawls ensure that when you travel alone, you become friends with everyone staying there! It was amazing! It was just in one word AMAZING! The hostel is nice and clean, the beds are comfy and the staff were super great!! They are so friendly and fun! Loved the free walking tour, the sintra tour and the pubcrawls! There is such a nice atmosphere in the hostel! The dinners were GREAT! And i met a bunch of lovely people. I definitely come back there some day! I stayed there for 6 days and it felt like home! I can’t describe enough how i loved it, but if you have to choose a hostel, go for this one! Had a wonderful time there! I didn't even expected it to be so nice! I was travelling alone because I wanted to take a break and it is the perfect place to go when you want to relax a little bit. The staff is super friendly, they treat you like a friend, and they always made sure I was okay. I've met a lot of people there because the hostel has various activities what makes it much easier to get to know people. The location is even more than great, I recommend everyone to go there! 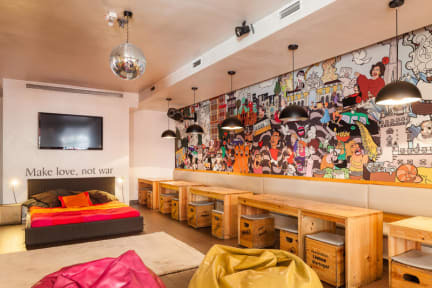 I would highly recommend the Yes hostel in Lisbon. The staff is super friendly and will make you feel at home from the very beginning. The atmosphere was great and all the activities that this hostel arranges (dinner, free walking tour, pub crawl etc.) were nice too. Everything was very clean. I would def go back, loved it! Hostel is ideaal gelegen, midden van het centrum dicht bij het stadsplein. Op korte afstand van het metro- en treinstation. Personeel is heel vriendelijk en vrijgevig. Is een verzamelpunt van vele reizigers over de hele wereld dus ook ideaal om veel interessante mensen te leren kennen. Door de excursies die ze organiseren kan je meer over de stad te weten komen en dit telkens met goed gezelschap. Zeker aangeraden om te verblijven tijdens een reis naar Lissabon. Great stay and great atmosphere. I really love this hostel! Especially the free walking tour with Rui and the hostel dinners! Fantastic location, employees were helpful and super friendly. Great hostel to meet new people and have a good time! The bar is nice and the food served every day has an really good price / quality ratio. Only downside is that i found it somewhat expensive for an hostel.